JAPAN: Sony speeds up LCDs for better 3D TV | What Hi-Fi? Using the new Hybrid FPA technology, the company says response times of less than 3ms have been achieved in testing – while still slower than the speeds possible with plasma and OLED panels, these faster panels should be better suited to technologies such as 3D and high frame-rate motion-smoothing. The technology also claims better stability both during manufacture and over long-term use, and is also faster and simpler to make than the company's previous high-speed LCD designs. 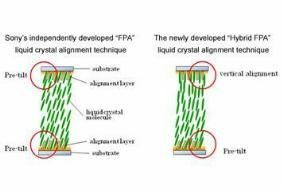 Sony previously developed its FPA 1 technology – Field-induced Photo-reactive Alignment –, using UV radiation during manufacture to maintain a pre-tilt of the liquid crystal molecules. This gives better alignment of the molecules, allowing faster response, greater uniformity and better contrast. The new Hybrid FPA uses the pre-tilt on just one side of the alignment layer, thus giving even faster response time, and especially reducing the reaction when voltage is reduced, which should give less 'overhang' in the image, and higher contrast. The technology has been developed with Japanese company JSR, and the companies say they are accelerating development work with a view to rapid implementation in new displays.